The 2015 IPAA paper referred to by the MJ protesters, titled “The Divestment Penalty: Estimating the Costs of Fossil Fuel Divestment to Select University Endowments,” cites the Board’s cost estimates and statements as an example of colleges weighing the costs of divestment over what are seen as minimal environmental benefits. 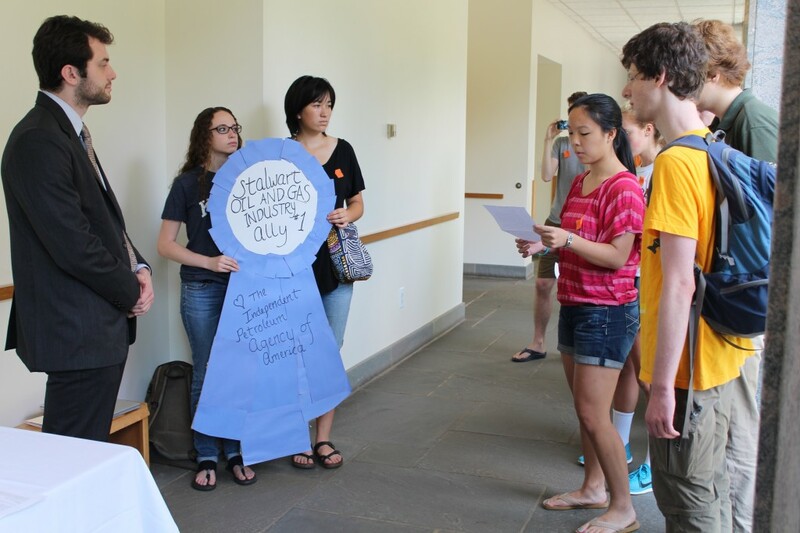 From Parrish, the protesters marched behind the Board’s blue ribbon to the Scheuer room in Kohlberg, where the September board meeting was being held. Chair of the Board of Managers Thomas Spock declined MJ’s invitation to come out of the meeting and accept the ribbon. O’Hanlon argued that this was a good sign and that it demonstrated the power of the divestment movement. MJ members Jacob Malin ’18, Annie Zhao ’18, and Sarah Dobbs ’18 took turns reading a prepared statement from outside of the meeting. 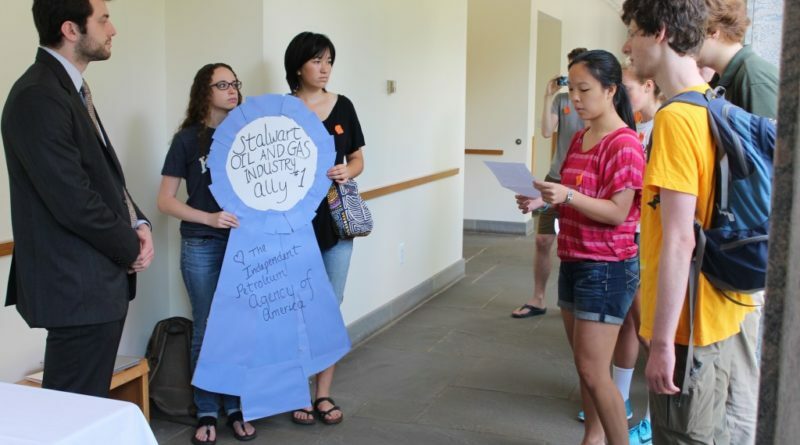 “We fully support students’ desire to express their views, and honor their right to do so. However, the Board did make its decision on divestment last May, coming to consensus after a very long and thoughtful discussion,” commented Spock in an email. “We are now committed to combating climate change by turning our sustainability goals into action on campus. Our hope is that we can now engage in meaningful, mutually respectful conversation about how the entire campus community can work together to combat climate change both by reaching carbon neutrality on campus as soon as possible, and by pushing forward with new initiatives of which we can all be proud.” According to Spock, the Board adopted a new “Sustainability Framework” during their meeting Saturday and discussed the groundwork for several new green initiatives that will be announced soon. It was unclear whether or to what extent the Board could hear the MJ speakers through the closed doors of the Scheuer room. At one point, what was presumably a joke told in the Board meeting produced a round of chuckles that was audible over the MJ speakers. At the end of their prepared speech, the MJ members gave the ribbon and an extended copy of their prepared statement to Assistant to the President Gabe Schechter, who it was arranged would receive the MJ action outside the Board meeting. The “Sustainability Framework” is praiseworthy, but should have been initiated long ago, given what has been known for decades about the crisis of climate change. Such initiatives, however, even if replicated at every campus around the country, will never be sufficient to accomplish the transformative societal changes which must occur to minimize catastrophic climate impacts for the future. Fossil-fuel companies, with their enormous financial clout and vested interest in the status quo, have been and continue to be primary players in lobbying, funding many obstructionist politicians, think tanks, and pontificators, and pursuing development of even more reserves (despite scientific consensus telling us that even current reserves will largely need to be left unburned if we’re to have any hope of keeping global temperature increases within relatively safe limits).